1. Crain, Jimmy Learning To Rock And Roll [unissued] uniss. 2. Crain, Jimmy Why Worry, Part 2 – (instr.) [unissued] uniss. 7. Crain, Jimmy Rockin' All Night Long [unissued] uniss. 8. Crain, Jimmy Mixin' It Up – (instr.) [unissued] uniss. 9. Crain, Jimmy We're Gonna Rock [unissued] uniss. 10. Crain, Jimmy Suzie Q Is The One For Me [unissued] uniss. 11. Crain, Jimmy Crushin' – (instr.) [unissued] uniss. 12. 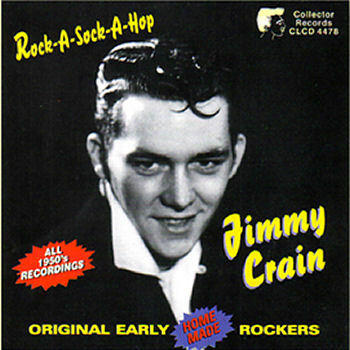 Crain, Jimmy She Loves Rock And Roll [unissued] uniss. 15. Crain, Jimmy We're Goin' Rockin' [unissued] uniss. 16. Crain, Jimmy I'm Gonna Get Ya' [unissued] uniss. 17. Crain, Jimmy Hey, Hey [unissued] uniss. 20. Crain, Jimmy Just Let Me Know [unissued] uniss. 21. Crain, Jimmy You Name It Rock – (instr.) [unissued] uniss. 22. Crain, Jimmy London Fog – (instr.) [unissued] uniss. 23. Crain, Jimmy Spooky Village – (instr.) [unissued] uniss. 25. Crain, Jimmy Jimmy's Nothin' Like It Rock – (instr.) [unissued] uniss. 26. Crain, Jimmy That's All Right [unissued] uniss. 27. Crain, Jimmy Morning Rock – (instr.) [unissued] uniss.